I hope that all comet observers are getting a chance to observe this nice object. It is now observable from the UK and nice images are coming in although these are not yet matching the images from remote telescopes in Australia. The Moon will be a problem for the next couple of weeks so some of the best UK images will probably start appearing in mid January. If you are a BAA member it is best to be logged in to the site since you will see updates earlier. This is because our pages are served to logged in members without having to wait for the normal cache updates. This image is nothing like the quality of the remote images but I feel much more "ownership" of it and expect to get a lot better later in January. 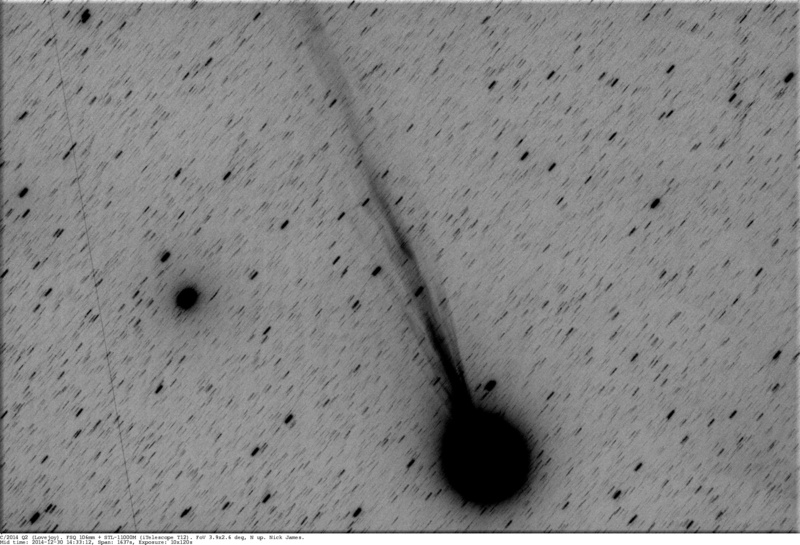 I've also seen the comet in 10x50 bins despite the low altitude and light pollution. It was surprisingly easy and, if you haven't looked yet, it is worth a try. 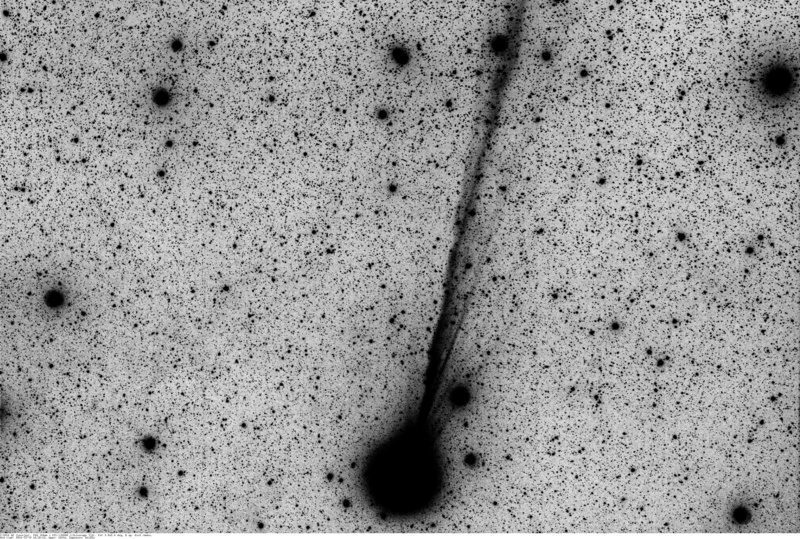 Interestingly I also imaged the comet from here yesterday night and despite what appeared to be better conditions the ion tail appears much fainter. where "20141228_2232" is the date and time and "ndj" is the observer name. Very many thanks to Terry for finding yet another nice object. One small point worth clarifying about the required file-naming format, because it isn't stated anywhere, so I had to ask, is that the time in the file name should be the mid-time of the image. So if, as common, you stack a series of sub-exposures, you need to work out what the mid-time was for the sequence. Maybe this was obvious to everone else, but not to me. Thanks for your UK image. Sounds like you had to do some considerable gardening to get it! While we would prefer the time part of the filename to be the mid-time of the exposure this is not essential and we're happy with start, middle or end. Ideally the caption on the figure should state which one is used, particularly where the total exposure time is long. The time part is actually optional so 2014q2_20141230_ndj.jpg and 2014q2_20141230_1452_ndj.jpg are both valid. I use the time to distinguish between multiple images taken on the same day, or even sometimes multiple ways of processing the same image. All the pages of the comet archive are automatically generated by scripts which depend on the correct filename structure. At present we are receiving 30-40 images of 2014 Q2 each day. This will no doubt increase so it does help us greatly if the filename conforms to these rules. Here is the result I was able to get from a light-polluted London suburb the first night it attained enough altitude, Dec. 28/29. A single 30s exposure shows it with M79 to upper right. A stack of 17 exposures, with extensive processing, revealed the tail (this surprised me considering the conditions and the 14 degree altitude). Inverting this image and making it mono shows the tail better. I could not see the comet visually with 10x50 binoculars, but I expect I soon will be able to. As it gains altitude certainly UK imagers will be able to reveal far more detail than this. My first image of this comet from my garden in Chelmsford. Over Christmas I was away in Somerset and had seen it from down there. Tonight I rushed home from work to take advantage of the nice clear sky. I had a good view of the comet visually in 11x80bins as the Moon was rising in the east. It was quite a large fuzz-ball but with no sign of a tail. This comet is definitely worth a loook and should be fairly easy to find with a pair of bins using the chart here. The Moon is now moving out of the way and this comet will be at its best for us over the next couple of weeks. 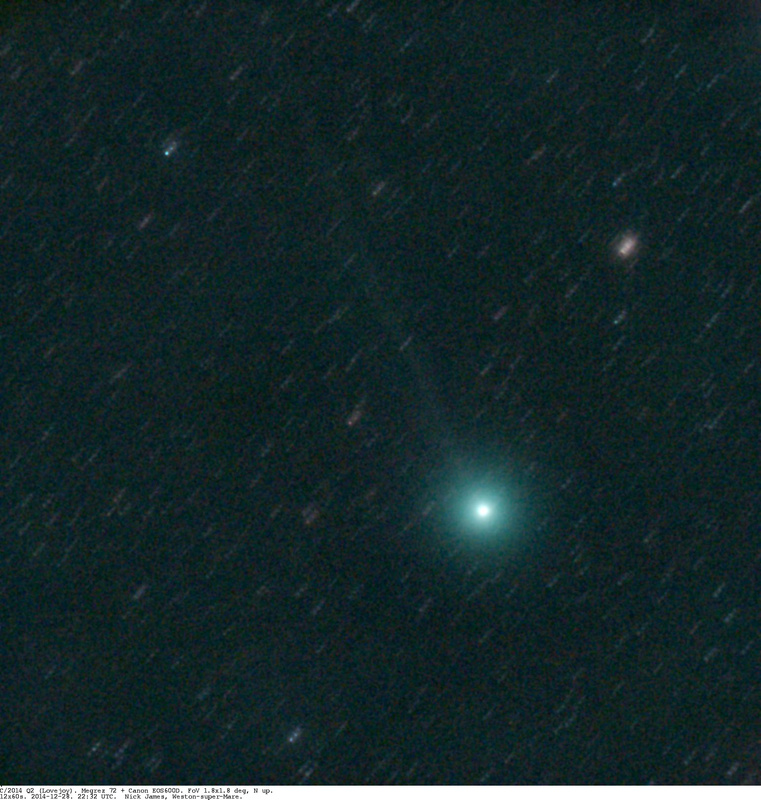 I had my first naked eye view of the comet last night and it was seen well in 8 x 40 binos. 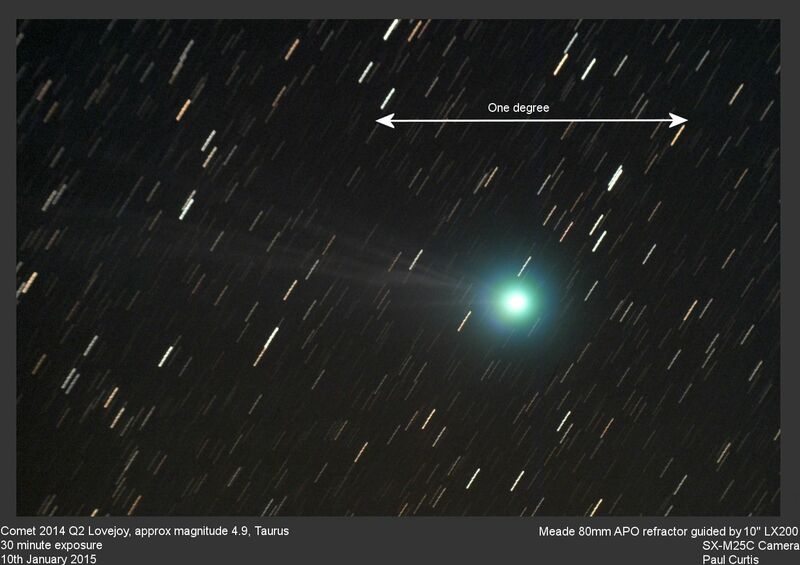 It's not often we get to see a bright comet, so I hope others will have an opportunity to look at it. Yes I got a good view of the comet last night too - it was a nice sight in binoculars. Here's a link to an image I took last night. With poor weather recently I've only managed a couple of views. Not naked eye from central Bristol and no sign of the tail with 12x32 binocs but certainly an impressive sight. I made it larger and slightly brighter and more condensed on Jan 13th compared with 10th. If next week goes cold and wintry then may still manage to make the most of the perihelion 'plateau'. This comet is proving elusive to me. I have seen it twice through binoculars, but. Every time I try and take an image. The clouds return. I have also been un-successful in making an observation without optical aid. At midnight on Jan 22/23 I made Lovejoy slightly smaller, fainter and less condensed than a week ago, though it was at a lower elevation with low level fog and 12x32 B eyepieces dewing up. Fingers crossed for another clear evening for better comparision over weekend.